In February, Craig the Architect alerted me to the heroic presence of a Russian folding bicycle within the Indianapolis gulag. An MMB3 for sale for $165 (or 4,723.57 rubles in early March). Now, thanks to Angela, a highly placed operative within the MMB3 sales pipeline, I can share the following information concerning the bike. I’m sure you would, Angela. I’m sure you would. 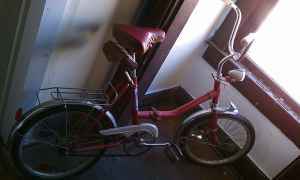 This entry was posted in Other bicycles and tagged folding bicycle, Indianapolis, MMB3, Russian. Bookmark the permalink.